Not to liken ketchup-makery exactly to the life path and career choices of taxidermists or beekeepers, but I’m just sayin’ it’s not an “oh, whatever” kind of thing. There’s some work involved. It’s totally worth it though. After we made a standard red ketchup at our Canvolution party a couple weekends ago (and I proceeded to spoon my portion right out of the jar) I was hooked on homemade ketchup. When orange heirlooms appeared last week in our CSA (farmshare), I figured why not shake things up in my limited ketchup experience. Julia, our August hostess, granted me a new ninja name, Small-batch Kickass. I gleefully accept. In line with my reduction-ist history, I made do with what I got from the CSA and added a few extra heirlooms from my co-op to make about half of what the recipe calls for. Slice an ‘X’ into the bottoms with a steak or paring knife. 2. Bring a pot of water (I used a 6-quart pot) to a full boil and then dip your X-marked tomatoes into the water for about 20 seconds. This helps loosen their skins so you can peel them easily. Peel carefully since they’ll be hot. Peeling tomatoes is cathartic after a long day at the computer.3. Core the tomatoes (aka remove the hard, middle portion of the tomato where it was attached to the vine). 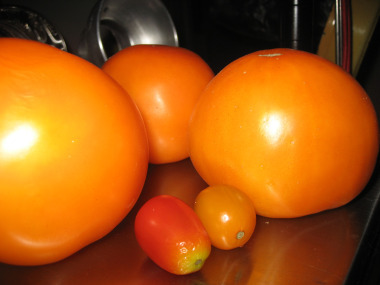 Chop the skinned tomato into a few large chunks and toss them into a food processor; I did it in two batches. Also, I’m a seeds-in kind of girl, but I bet you could strain most out using a mesh strainer as you pour the puree into the cooking pot. 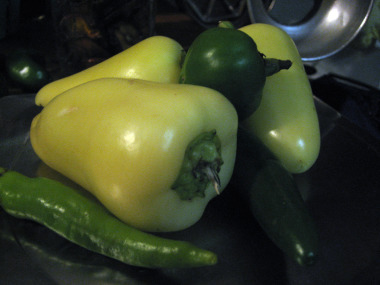 Pour puree directly into a large, heavy-bottomed stainless steel or enameled cast-iron pot. I ended up with about 5 cups of tomato puree. Simmer tomato puree and veggies for 15-20 min, until the veggies are tender. 7. 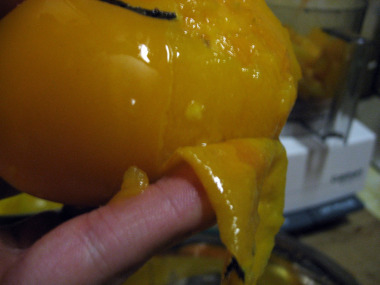 When veggies are tender, remove tomato puree and veg mixture from heat. Ladle out cupfuls of the mixture into your food processor (or blender) until you hit the ‘liquid fill line’ marked on most processor bowls. Trust me, you’re going to want to do this in shifts (or you’ll shoot pureed tomato juice and bits around the kitchen). I did it in three batches. 9. Simmer ketchup until it thickens up. The smaller the batch, the faster it will thicken. Mine took about a half hour, but my burner was up too high in the beginning (oops). 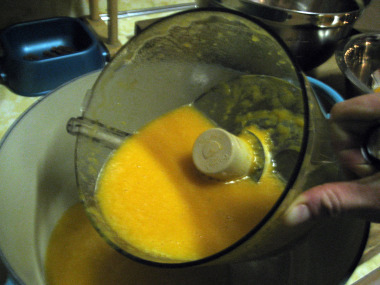 Low and slow is the general rule for thickening. Stir occasionally to incorporate all portions of the mixture and keep bottom from scorching. 10. Remove spicebag and ladle hot ketchup into hot jars leaving 1/4” headspace and seal with two-piece lids. Process for 15 minutes in a waterbath. Alternatively you could stash it in the fridge if you’ve had enough of the stovetop for the evening. It’s high in vinegar and should keep fine for a few months. Aaaaand the taste…It’s not hot, by any means. There’s no sugar in it, so it won’t taste like your standard ketchup, but this tangy condiment adds a tasty vinegary zest to whatever you dare dollop.